The previous post noted new complexity in the regulation of DNA that was just discovered. 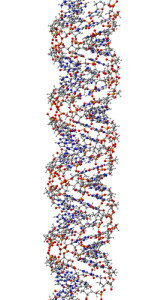 As well as the many levels of regulation, physical properties helped regulate how DNA is used. Now there is yet another new development—circular DNA in human cells adds even more complexity. The number of ways that DNA is regulated is staggering and impossible to understand. These were listed in the previous post. 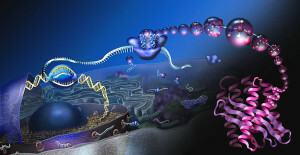 Regulation involves proteins that trigger and stop the production of RNA from DNA. New data shows that these protein triggers can operate both in the special regions just before the genes (thought to be the only locations) and also in the middle of what were considered genes, which was never considered before. This different meant that what was called a gene had to re worked. The compaction of DNA is done by housing them on protein spools that look like yo yos, called histones. These histones with the wound DNA are then rolled up into clusters. But these histones have forty different tags that are placed on them by enzymes, each altering the function of the DNA on that histone. Methyl groups and acetyls are well known, but many more are now known. Just for more confusion, there are also tags that go on the naked DNA as well changing functions in a variety of ways. Another layer of regulation involve the vast amount of RNAs that don’t make proteins, but rather like proteins stimulate and block various actions. Yet, another complication is that when messenger RNA is make it is extensively edited. First to take out code that is not part of the “gene”. But, also rearranged in up to 500 different ways to make 500 completely different proteins in a process called “alternative RNA splicing” (see post). The previous post noted the two completely new findings that are based on the physical properties of molecules. 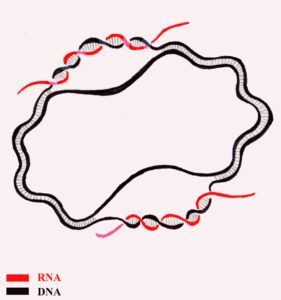 One was unique clustering of parts of RNA that have many repeated segments. This clustering appears to be important in producing brain diseases. The second completely new finding is related to the three dimensional structure of the nucleus where one region houses chromatin that is suppressed and not active. The other region has the parts of the DNA that are opened and actively making RNA code, producing RNAs and then proteins. This difference appears at least in part due to physical properties of the liquid phase. These are like quantum effects that are known, but for which there is only now information on how they might affect biological properties. In the realm of quantum effects, new biological information is occurring about photosynthesis, chemical reactions and possibly magnetic effects in birds. Please see post for a summary of the quantum biological effects. One of these liquid properties occurs in the region of active DNA and the other where it is suppressed. For a summary of the two new physical effects that dramatically alter DNA function, see the previous post, which also includes a brief summary of all the layers of regulation. More detailed posts are also referred to—three dimensional affects in the nucleus, and new codes nesting on other codes. This post will discuss a totally new development this week. 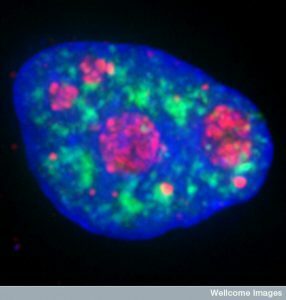 The discovery of unusual circular DNA in human cells that appears to have some function. Unusual circular strands of DNA have been noticed over the years in some human cells, but not all. They appear to exist in the nucleus between the more standard linear chromosomes. This has been given the standard name for a new discovery—the circulome. This is also known as extra chromosomal circular DNA. Since no one was looking for these small objects before, now more and more are being observed because we are looking. Circular DNA provides extra copies of certain genes and these are being shown to possibly alter the function of other DNA and to even be involved in cancerous development. There is a possibility that these are sent in exome sacs as genetic information to other cells, such as for cancer to alter their environment by turning local cells to help them and to prepare the ground for metastases. See posts on information sent in sacks and in metastatic signals. There are several different types of circular DNA. One is the normal type of DNA in microbes. These human rings are different than those in microbes and were first discovered in plants. They were then found in the nuclei of brain cancer cells. Each provided multiple copies of vital genes for the cancer’s development. Now, the most recent data is that at least half of human cancers have significant large circular DNA rings. These have been found to be surprisingly large—even as much as five million code letters. These huge strands of DNA have many copies of vital genes that help the cancer—called oncogenes. Having so many genes freely available at once allows for rapid growth by producing a much larger amount of proteins to build new cancer cells. Cells make more copies of the circular DNA during the normal cell division when all of the DNA is duplicated. What is different is that the circular rings of DNA may not be in all the daughter cells. Some daughter cells might have a lot more than others. This can make some of the daughters particularly prone to become cancerous. 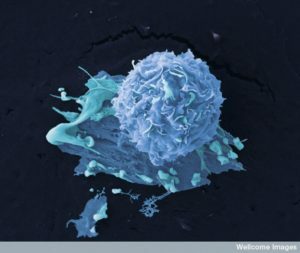 If one of the cells ends up with a large amount of oncogenes, this can become the stem cell for the entire cancer. 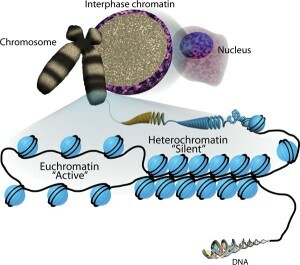 Some of the cancer genes in the circular gene can be placed into the main chromosome, as well. This is similar to transfers that occur in the microbe world. This explains how oncogenes end up in strange new places in the chromosome. 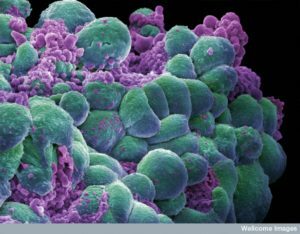 This opens entirely new ways to think about how cancers grow. Very recently, this process was noted in cancers of brain glia cells—glioblastoma. In this process a particular gene called MET greatly increased 13 different glioblastoma brain cancers. These same cancer cells were then experimentally put into mice and the same thing happened with these circular oncogenes. In normal cells, there is a wide range of different sizes and different genes in circular DNA rings. The largest has sixteen thousand code letters. It is not clear what they are doing, but the large number of very active genes is now being investigated. 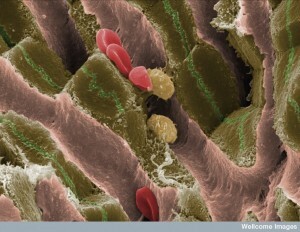 It is possible that these are the ways that cells differentiate different types of cells and their functions. In fact, the most recent information shows that different tissues have particular genes that are specialized. An example are muscle cells in the heart have many genes in the circular DNA rings related to the protein titin. Titin is an extremely large protein that performs as a spring for muscle movement. These rings are undoubtedly part of the of the communication process. They are placed in sacks as part of the vital information sent to cells that are far away. Studies show that in mouse research new cells placed in the mice almost immediately send a large number of circular DNA rings into the blood. Since these are only now being recognized, research is just beginning. Circular DNA is yet another new development for vastly complex processes that have no apparent direction. The regulation of DNA is beyond complex and growing more strange with each new discovery. This totally new type of DNA still needs a lot of research, but could answer some basic questions about how cells communicate. It might be the missing pieces as to how cells are so different in each organ. It might explain how the new cells produced in each unique organ know what type of cell they are supposed to be. The story of DNA just gets more and more complex with the vast number of inter related regulatory mechanisms. There is no apparent direction for these processes, yet they are correlated with mental experience. Any mental event correlates with vast numbers of genetic events, vast numbers of neuron alterations of neuroplasticity in places all over the brain, all in milliseconds. This entry was posted in Blog and tagged Circular DNA is found in cancer cells, Circular DNA in humans might differentiate organs. Bookmark the permalink.